Students will be able to identify and define a vertebrate and an invertebrate. Students will be able to classify animals as a vertebrate or an invertebrate. Tell your students that they will be learning about VertebratesAnd Invertebrates. Tell your students that a vertebrate has a backbone while an invertebrate does not. Ask your students if they are vertebrates or invertebrates. Tell your students to draw two columns and label them VertebratesAnd Invertebrates. Tell them to write the different types for each kind in their columns as you explain them. 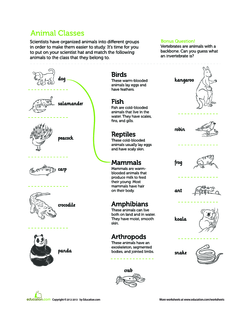 Tell your students that there are five main types of vertebrates: mammals, reptiles, fish, birds, and amphibians. Write these on the board. Give your students examples of each type, such as humans, crocodiles, goldfish, parrots, and frogs. Tell your students that there are five main types of invertebrates: protozoa, echinoderms, annelids, mollusks, and arthropods. Write these on the board and ask your students to write them in the second column. 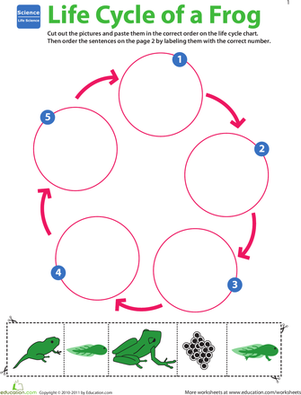 Offer examples of each, such as algae and bacteria, starfish, earthworms, octopi, and spiders. Tell your students to write the example that you give next to each kind in their columns as well. 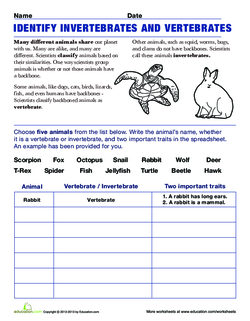 Ask your students to complete the Identify Invertebrates and Vertebrates worksheet with a partner. 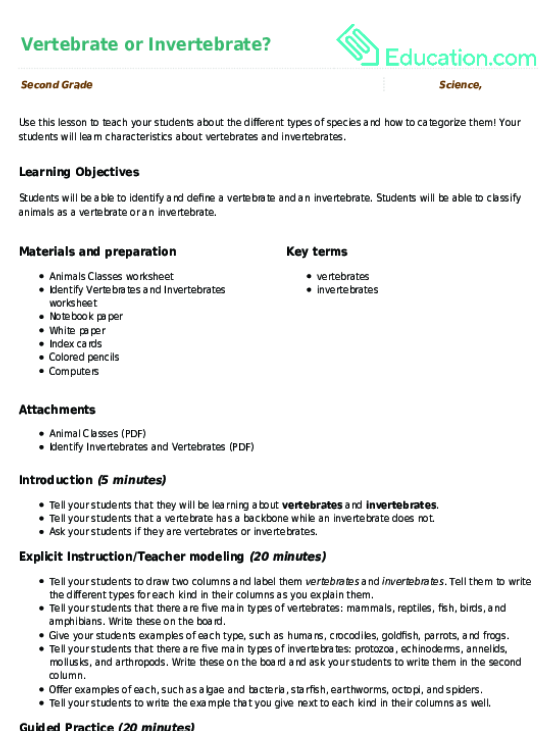 Have your students complete the Animal Classes worksheet. Enrichment:Ask your students to pick an invertebrate. Have them go to the library and find a book on that invertebrate. Ask your students to find and write five facts about that particular invertebrate. Tell them to draw a picture of the invertebrate as well. Support:Have your students come to the back of the class. Give them each ten index cards. Tell them to write the five kinds of vertebrates on five of the cards. They should use one card per kind. Show them a picture of each kind on the computer. Ask them to draw the picture on their card. Repeat this for invertebrates. 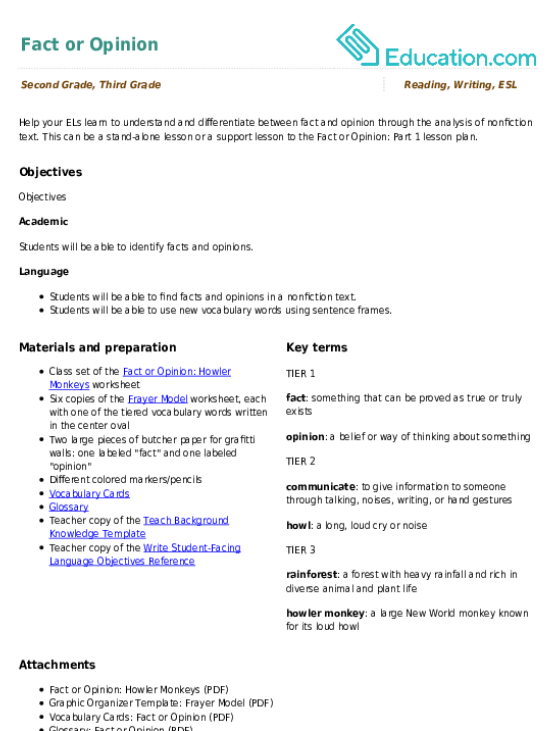 Conduct a short quiz on vertebrates and invertebrates. Potential questions include: Which type of animal has a backbone? Which type of animal does not have a backbone? Name any two types of vertebrates. Name any two types of invertebrates. Ask your students to pick a vertebrate and an invertebrate. Instruct them to draw them on white paper. Ask your students to write the name of the vertebrate and invertebrate as well. Find your way through the neighbourhood to get to the trick-or-treat bag at the bottom. This works great as either a challenging activity or as an assessment.